MINNESOTA, June 21, 2012 (LifeSiteNews.com) —Collegeville, Minnesota’s notoriously liberal Benedictine community of St. John’s Abbey is in the spotlight once again as one of its monks urges Catholics to oppose the cause for true marriage. On June 10th, openly homosexual priest Fr. Bob Pierson, the guest-master at St. John’s, told over 200 people at a Methodist church in Edina, Minneapolis, that “Catholics can vote no” on Minnesota’s proposed constitutional amendment prohibiting gay marriage. Pierson, who styled himself an “LGBT ally”, made his case by selectively quoting the Catechism of the Catholic Church and voicing disagreement with the Vatican on certain issues. The event was organized by Minnesotans United for All Families (MUAF), a homosexual activist group campaigning to defeat the amendment. “I knew that I was gay when I was ordained,” Fr. Pierson stated, after saying that he was “offended to learn” from a 2005 Vatican document that the Church has declared that men with deep-seated homosexual tendencies cannot be priests. To defend voting “no” on the amendment, Fr. Pierson also argued for “freedom of conscience.” He quoted the Catechism’s doctrine that “a Catholic person must not be forced to act contrary to his conscience.” However, Fr. Pierson omitted the rest of the quotation, which states that the conscience must be informed by a higher authority. Fr. 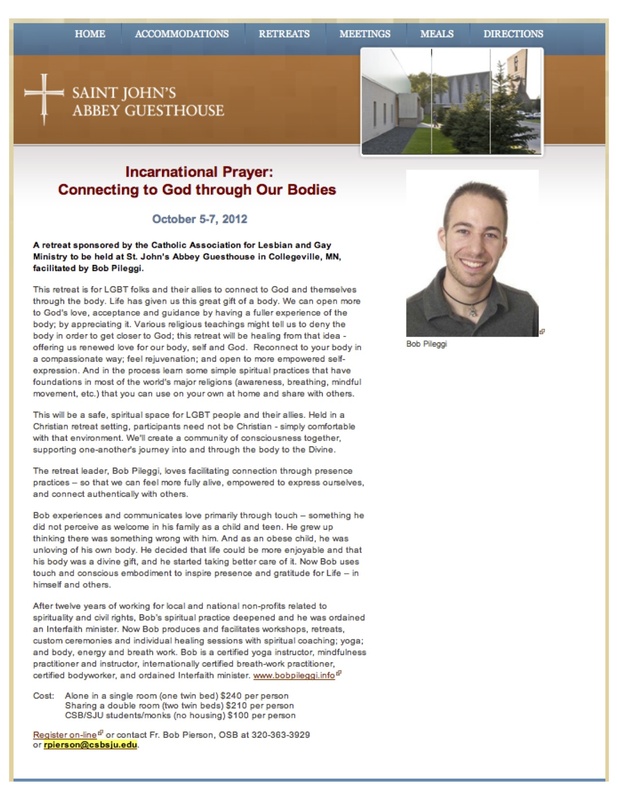 Pierson apparently cancelled the retreat due to complaints and information about it has been removed from the abbey’s Guesthouse website. However, Behind the Pine Curtain, a blog dedicated to exposing “sexual abuse and misconduct” at St. John’s, has retained a screenshot of the guesthouse website, containing the retreat details. More information on Pileggi’s retreats—including statements such as: “massage portions of the weekend will be clothing optional”—can also still be found at Pileggi’s website. The monastery has been subject to numerous sexual abuse allegations. According to America magazine, Fr. Pierson was listed as a priest in good standing in the 2011 Official Catholic Directory. LifeSiteNews made numerous attempts by phone over several days to contact Fr. Pierson’s abbey, but St. John’s failed to reply.